This beautiful diamond engagement ring from the Masterwork Collection by Ritani is as lovely as the woman who will wear it. 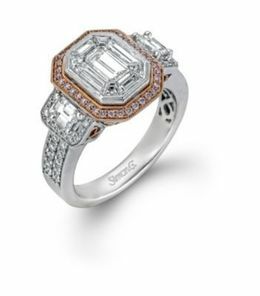 The ring is set in 18 karat white gold and features a cushion halo with a round cut center stone. Micro pave diamonds surround the center and on the mounting with two rows of pave diamonds on a knife edge shank. 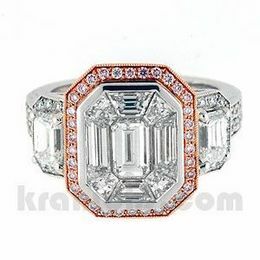 The ring has .53 carat total weight diamonds not including a center stone.